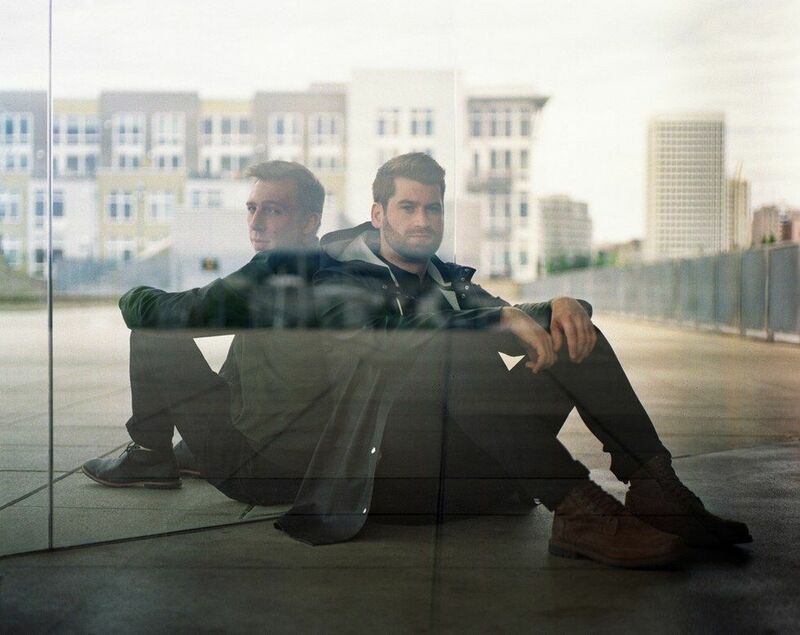 Electronic duo Odesza burst onto the music scene with their debut LP Summer's Gone in 2012, racking up a million Soundcloud plays a year before their official debut EP was even released. Comprised of Clayton Knight and Harrison Mills, Odesza has consistently produced almost too-perfect music in an over-saturated electronic market, hitting the 30 million play mark on Soundcloud by the time of the headlining tour for their well-received album In Return in 2014. They've hit the festival circuit hard, playing spots in over 20 shows, and finally took some time this year to return to Seattle to take a breather (and take some time to write) for perhaps the first time since they met at Western Washington University. Odesza's highly anticipated sophomore album, A Moment Apart, dropped today and it's already garnering positive reviews. PAPER snagged a few minutes with Clay as he and Harrison gear up for a world tour to chat about working with Regina Spektor and Leon Bridges, not listening to other music and how they put together their infamously elaborate live shows. PAPER: So it's been three years since your last album came out. What has changed for you guys in that time? Clay: In Return was definitely our first venture into more serious songwriting, and this album we're definitely trying to revive what we started with In Return, and get better at writing songs and being more involved in the songwriting process in a lot of ways. With In Return we'd send basic demos to artists and vocalists and they'd write and they'd write lines back and forth. A lot of it was done online. But with this album, a lot of it was done in the studio, we were flying down to LA and working with a lot of different writers and other vocalists in the studio and being more hands on. A lot of these ideas started before In Return was even out, and it's just been fine-tuning the craft and trying to get these ideas that we've had in our head for a long time finally out. It's a little more orchestral, a more grandiose sound to it, and kind of a more epic feel. How do you plan to incorporate this new material into your live performances, which are such a big part of how you connect with your fans? Definitely, definitely. That's process - as soon as the album was done we started working on the live show, which is a whole project itself. A lot of the album stuff is a little more low key, we're big fans of headphone-oriented albums that you can lose yourself in, but that usually doesn't translate too well to a live show, and so we'll kind of beef them up and add more energetic elements here and there to the tracks, almost remix them for the live set. And then mix and matching with the old stuff, blending some together. Basically we use all our stems, which are just little sound pieces, in the live show. And we can mix and match different vocal pieces with different songs. You can do a lot that you couldn't do with a basic DJ set up. It's definitely a lot of work, but it makes for a pretty unique experience and unique sound. You're able to blend all these different elements. Is your live performance typically quite different from the album? Yes some of them are, not all the stuff, but like our intro now, I maybe shouldn't be telling you this but I'm going to tell you anyway, it has the intro of the album and "A Moment Apart," a song on the album, but the revamped version of that, little more broken down, we built a big horn piece for it, and then it blends with another track midway through, so yeah it's a lot of, we try to retain a lot of the quality of the track, you know people want to come hear our music. But we also try to give them new versions and new takes. What's your collaborative process like with Harrison [Mills]? It varies from track to track of course. But yeah the writing for this one, first we got off the road and kind of decompressed for a bit. But while we were on the road we started a bunch of different ideas, which could be as simple as some piano chords, a melody, and then we'll develop it to where we think we have a good direction, sit down, talk about it, and usually we'll hand it off or we'll sit in the studio together and try to add a bunch of different layers and pieces so we almost have too much stuff, and then it's the point we call trimming the fat, picking pieces that work and picking pieces that don't clash. And that can be kind of a tough process because you get emotionally attached to something that you've worked on for a couple weeks. But if it doesn't work you have to cut it. What's your favorite track from A Moment Apart? I love all of them, but I think the Leon Bridges track is one of my favorites. He was such a cool dude to work with, and the song is so good. But I love all of them. In addition to Leon you also brought Regina Spektor on for this album. How did those collaborations come about? Well each one was different. We reached out when we started writing to a bunch of artists. We tried to figure out who was around and available, and we actually worked with a lot of different vocalists and what not, and after time went on we tried to work with some bigger names. But usually with that, there's a little more ego involved and they have a sound in mind and they're just not willing to do as much. So I've discovered that working with people outside the electronic realm helps with the creative process because they're a little bit more open to experimenting with stuff and trying new ideas. Just a little more back and forth for someone to be like, this is what I'm hearing, this is what I want it to sound like. Do you write the vocal parts? All the vocal pieces were collaborative, like Leon Bridges for example, we had him in because he was in Seattle for a private gig one day and he had eight hours to kill so he popped in the studio, and we sat down with this really simple beat. And he started kind of just jamming on it, we told him what we were looking for, and kind of worked side by side with him on the vocals during that studio session and that's what came out of it. So most of the tracks were written that way. Regina was the only one who, she kind of wrote that completely herself. We didn't get into the studio with her till later on to rerecord some vocal pieces and fine tune what she had already laid down. What's your musical diet? What kind of music do you listen to when you're touring vs. when you're writing? One thing I actually try to do with writing is kind of live in a bubble and not listen to a lot of music. I think you get too attached or too influenced to other stuff around you and kind of lose track of what you may be trying to dial in on your own, maybe something a little bit more unique. But before going into the writing process we usually go back and listen to the albums we fell in love with in the first place. So M83, these early electronic artists that we really love, we kind of get re-inspired in some sense. But yeah we try to zone out in our world while writing. Yeah you've got to lose yourself in it. It takes awhile to make something very personal and very you. You don't really want too much outside influence seeping into that.